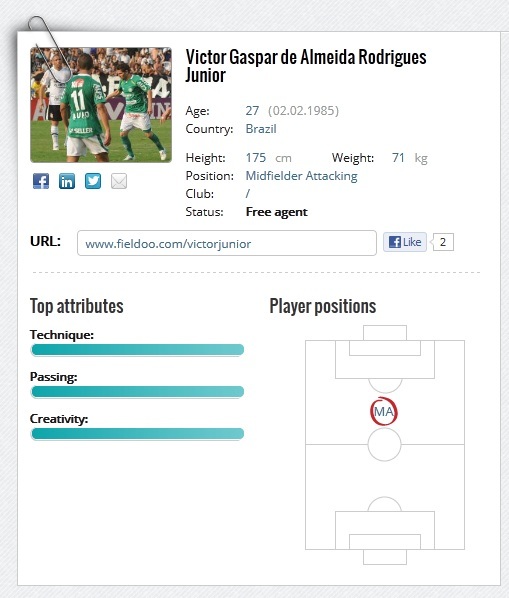 Victor Gaspar de Almeida Rodrigues Junior – Fieldoo member who played in 1st Brazilian & Portugal League. We have successfully tested our platform and already signed up football players from over 40 countries! We have also looked at and measured their response and got fantastic feedback and valuable information. Now, we’re proud to announce Fieldoo – Sports Career Network – is public and open for football players, who can create free account. 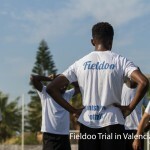 Starting with a sports CV and a career book function (all data and history in one place), as the basis of Fieldoo’s mission – virtual showcase for football players. The CV gathers all essentials on one single link (fieldoo.com/YourName), discarding multiple mails to agents, DVDs or even hard copy CVs. 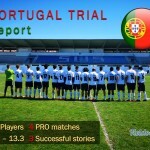 One of the key features, which is very popular with our first users, is the so called Match, where a football player creates (updates) his upcoming game or past performance – complete with all the necessary data – and notifies whoever he wants (friends, family, agents and others) through social networks or email. Check out here how Dzengis Cavusevic (St. Gallen, Swiss Super League) used this feature to tell the world how he scored a goal against German champions Borussia Dortmund and got hundreds of clicks and views. In the near future we will add more features, such as network and connect with friends and (ex) teammates, messaging, activity feed, later to be followed by interactive features, such as customized infographics of performances and personalized goal setting; for your best possible experience. In the upcoming months the agents’ platform will be released, featuring their own professional website as a digital résumé (CV) and portfolio presentation. Players and agents will connect and interact to provide opportunities for career progression. However, agents can already look and browse for players, thus working to expand their portfolio with talents from all over the world. Need more information? Check out our help & learn page, look at the frequently asked questions section or just browse around on fieldoo.com and check out our users from all over the world. And if you’re a football player, make the first step, create a free account and show your potential!